Everything You Need To Know About Your Miniature Australian Shepherd. Well regarded as some of the greatest shepherding canines in the whole dog universe, Miniature Australian Shepherds can easily be trained and are extremely smart. Miniature Australian Shepherds are in fact the same species as teacup australian shepherd dogs and regular Australian Shepherds that were selectively bred for their smaller stature. Some believe that the minis were the original shepherd species and they were later selectively bred into the larger regular shepherds. Due to their instinctive traits as a herding dog, they have a very strongly developed protective instinct and they make great watch dogs. On ranches, they will often give their own lives to protect the flocks that they are herding. And at home, they will guard and protect your family with the same vigilance. So far as their behavior goes, they will most definitely produce warning barks if they sense an intruder, however they tend not to be excessive barkers. They are excellent, loyal, friendly companions that love to cuddle and they make great family pets. Young children will have to be taught how to behave properly around them, but once they learn how to treat your Aussie properly, they will become good friends. Miniature Australian Shepherds make wonderful family pets, provided the family has plenty of time for them. Like other smart canines, Aussie shepherds get bored rapidly, in particular, when they have been left by themselves for too long. These types of dog will gnaw on nearly anything when they start to become bored, and they are very infamous escape artists and they like to dig holes too. Aussie shepherds which get loads of exercise will have very few of these problems. Since these dogs are well-known for their herding abilities, you better believe that they need a great quantity of energetic exercise. You can help your dog exercises by doing a number of things. Letting it run free in a field such as a dog park is ideal. You can also give your Aussie some real work to do, such as carrying a pack on a walk. Your Aussie will enjoy playing games of catch with a ball or a Frisbee, and going for long runs. They thrive in being part of the action and are willing company on outings such as fishing or hunting trips. Or they’d simply love to be with you while you did a little yard work at home. People interested in raising the type of dog that needs certain requirements should consider acquiring it as a puppy. In this way, your Aussie puppy can be properly trained and will also become comfortable with the people it will be living with. It is important to provide your brand-new puppy its own spot like a crate or kennel when it is brought home. You can include toys and a blanket inside the crate so that he has something to occupy his time if he wakes up during the night. This will keep puppies off of the furniture at night and in their own established area. Aussie shepherds have to be given obedience training straight away to control their instinct to assume the dominant role in the family. Dogs are pack animals and tend to follow the lead of the alpha dog. Your objective, with your Aussie, is to make sure that you are the leader, or the alpha dog, or your Aussie will walk all over you. 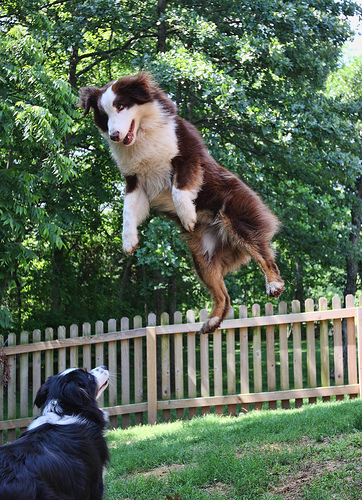 The Australian Shepherd is a dog that exudes a tremendous amount of energy and drive. With their extreme intelligence and eagerness to please, they are capable and excel at a number of endeavors. They are used as guide animals for the blind, search-and-rescue animals, therapy animals, hearing animals for the deaf, show dogs and drug detecting animals. In addition, Aussies are used to drive livestock like cattle and sheep on working ranches, and are highly competitive in obedience, agility, utility, and other performance disciplines. They are happiest when they have a job to do. Of course, Australian Shepherds make wonderful family companions, too, provided that the family that adopts the Aussie has ample time and abundant space for their new friend. If you aren’t able to provide all of the space and attention that an Aussie requires, you should really reconsider getting one. But if you can provide all that is required, you will be rewarded with an intelligent companion.